By clicking on the cover of each book you will be redirected to an outside website for purchase of the book. These websites are not affiliated with Decoding Dyslexia CA. This straightforward guide provides the essential information for parents and advocates to understand US law and get the right educational entitlements for a child with dyslexia. Using case studies and examples, this book demonstrates clearly how to apply the Individuals with Disabilities Education Act (IDEA) to the unique requirements of a dyslexic child. It offers simple, intelligible help for parents on how to coordinate successfully with their child’s school and achieve the right services and support for their dyslexic child; up to and beyond getting an effective Individual Education Plan (IEP). Dyslexia- Decoding the System is an invaluable tool for parents trying to negotiate a complex legal system in order to get the best outcome for their child. It is an essential guide for anyone who is considering acting as an advocate for a child with dyslexia. Overcoming Dyslexia: A New and Complete Science-Based Program for Reading Problems at Any Level by Sally Shaywitz, M.D. ; Vintage (2005) — A great book that explains what dyslexia is and gives parents tools for helping their children become fluent readers. One of the most helpful and informative books that most parents read early in their journey that really open their eyes and pointed them in the right direction to seek the help their kids needed. Essentials of Assessment and Intervention by Nancy Mather & Barbara Wendling; John Wiley & Sons (2013) — A great book for teachers that provides practical e step-by stepinformation on accurately identifying, assessing, and using evidence based interventions with individuals with dyslexia. Addressing the components that need to be considered in the assessment of both cognitive and academic – this book includes descriptions of the various tests used in a comprehensive dyslexia assessment along with detailed, evidence-based interventions that professionals and parents can use to help individuals struggling with dyslexia. 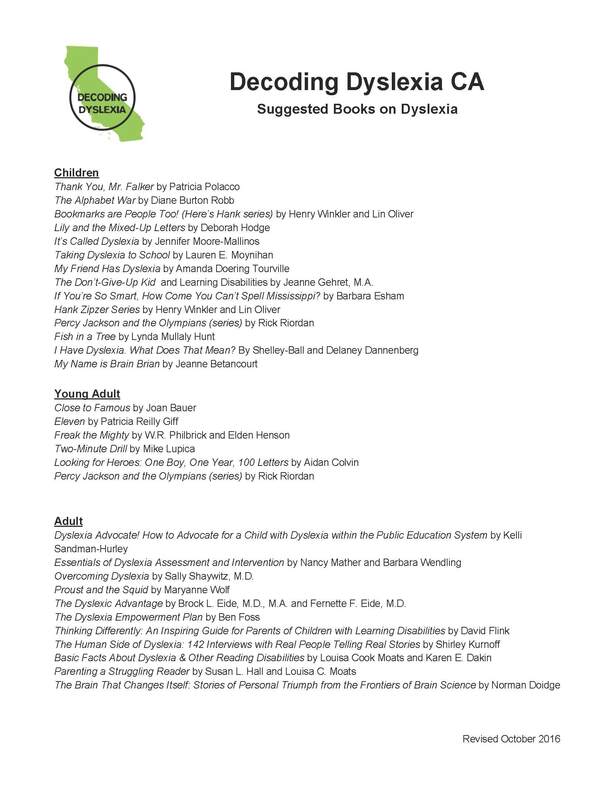 The Dyslexia Empowerment Plan by Ben Foss; Ballantine Books (2013) — A great book for parents that gets down to the heart of the matter; how to empower children with dyslexia. The author from personal experience knows that our kids will learn to read and write, but it is their feeling of self-worth and empowerment that will facilitate their life long success. This is a must read! Parenting a Struggling Reader by Susan L. Hall and Louisa C. Moats; Broadway (2002) — This book helped explain how school systems work and provided real-world practical guidance on how to understand and work within the framework of the public school system. It also helped us understand the need to sometimes look outside public schools for additional resources. Wrightslaw: From Emotions to Advocacy: The Special Education Survival Guide by Pam Wright and Pete Wright; Harbor House Law Press (2006) — Realizing that your child has an LD (or any disability) can set parents off on a roller coaster of emotions. This fabulous book helped us distinguish facts from emotions in order to properly document the facts and best advocate for our daughter. The Human Side of Dyslexia: 142 Interviews with Real People Telling Real Stories About Their Coping Strategies with Dyslexia by Shirley Kurnoff; London Universal, (2001) — Just as the title says, this book is packed with real stories by people with dyslexia. While many books on dyslexia focus on the mechanics of the learning disability, this is the human story of the people who live with it. Through their stories we learn their strategies and tools for coping with the reading disability. Many of the stories are inspirational and will be a comfort to parents who worry about their child’s future. The Brain That Changes Itself: Stories of Personal Triumph from the Frontiers of Brain Science by Norman Doidge; Penguin Books (2007) — An astonishing new science called “neuroplasticity” is overthrowing the centuries-old notion that the human brain is immutable. In this revolutionary look at the brain, psychiatrist and psychoanalyst Norman Doidge, M.D., provides an introduction to both the brilliant scientists championing neuroplasticity and the people whose lives they’ve transformed. The Dyslexic Advantage: Unlocking the Hidden Potential of the Dyslexic Brain by Brock L. Eide M.D. M.A. and Fernette F. Eide M.D., Plume (2012) — In this groundbreaking book, Brock and Fernette Eide explain how 20% of people—individuals with dyslexia—share a unique learning style that can create advantages in a classroom, at a job, or at home. Using their combined expertise in neurology and education, the authors show how these individuals not only perceive the written word differently but may also excel at spatial reasoning, see insightful connections that others simply miss, understand the world in stories, and display amazing creativity. “Human beings were never born to read,” writes Tufts University cognitive neuroscientist and child development expert Maryanne Wolf. Reading is a human invention that reflects how the brain rearranges itself to learn something new. In this ambitious, provocative book, Wolf chronicles the remarkable journey of the reading brain not only over the past five thousand years, since writing began, but also over the course of a single child’s life, showing in the process why children with dyslexia have reading difficulties and singular gifts. Focusing on how to arm students who think and learn differently with essential skills, including meta-cognition and self-advocacy, Flink offers real, hard advice, providing the tools to address specific problems they face—from building self-esteem and reconstructing the learning environment, to getting proper diagnoses and discovering their inner gifts. With his easy, hands-on “Step-by-Step Launchpad to Empowerment,” parents can take immediate steps to improve their children’s lives. A must-have guide for any parent or teacher of a child struggling to learn to read, this essential resource begins by answering the question “What is Dyslexia?” The authors have masterfully selected and distilled the most significant research in the field to provide clear and detailed explanations.